I saw these cute little gummy bear ghosts over on Edible Crafts. Such a fun idea. 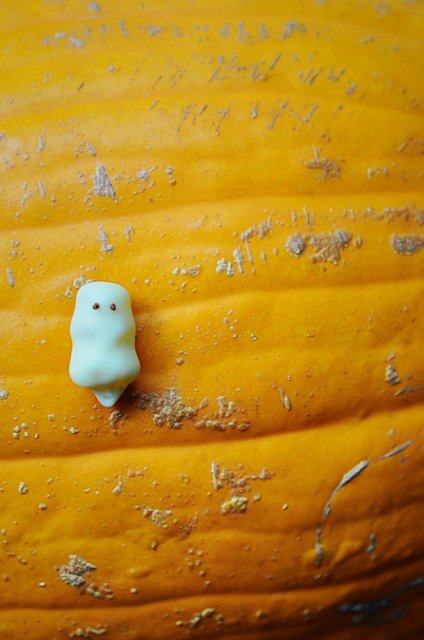 Dip them in white chocolate to dress them up for Halloween. If you wanted something larger you could use cinnamon bears too. They are really good in chocolate, so I imagine they can't be terrible in white chocolate. You can see how to make your own gummy bear ghosts and check out how she packaged them as a Halloween gift over at The Cheese Thief.